15.6 kg. 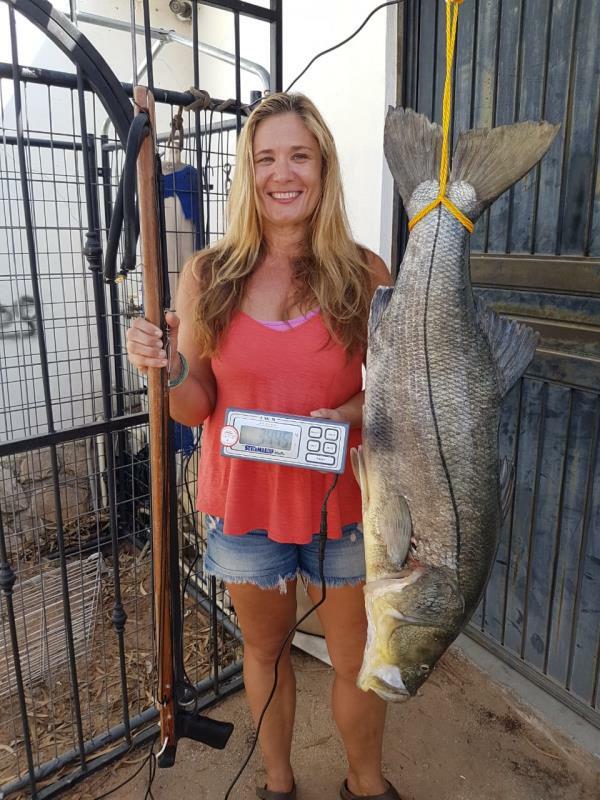 , 34.5 lbs. Living in Cabo San Lucas, we get the luxury of choosing The Sea of Cortez or Pacific Ocean. On this Wednesday night Ricardo Ayala, Pablo and I headed to the Pacific to hunt Cubera. The swell was high and it was difficult to get into our favorite spots and it felt like I was spearfishing in a washing machine. We eventually found some calmer waters, but had no luck...strong current and no fish. At sunset, on our way towards Cabo, the conditions started to mellow and Ricardo made the smart call that we check one last spot. A few hours before this location was too turbulent to dive. Captain Miguel dropped us and I swam 150-200 yards towards the rocks. The swell was creating a ton a white wash, making visibility very low. I got close enough to a rock structure where I felt safe enough to do a dive and the water visibility was 5-10ft. I dove to the bottom at 25 ft, from there I saw a profile of a large fish swimming above me. I slowly came up (15ft) and the fish came towards me. I quickly had to identify if this was a fish I wanted to take before the next swell surge came through and tossed me around. I realized it was my lucky day and it was a beautiful Black Snook and I took the shot right behind the gill. I instantly grabbed the line and started swimming towards the boat to get away from the rocks, surging swell and to give some space to my friend Pablo who was about 20 ft away. Once at a safe distance, I pulled the fish all the way in, secured it and swam to the boat where Captain Miguel reached down with a gaff and easily raised it into the boat.